Entering into the third year of the DISC project, the STC meeting after 24 months of the project was held at Fraunhofer ISE in Freiburg, Germany on Oct 15-16 2018. The development-phase work packages are finalizing their solutions and making them ready to work together in the integration phase. Simultaneously, in the integration phase the first common cell prototype was developed. First application of electroplating metallization on In free layer (PVD AZO) leading to 20.9% solar cell efficiency. New Round Robin combining optimized CSJs and TCO layers is on going and is focusing on device relevant layers. Simulation based loss analysis for transparent metal compound based carrier selective contacts. Printed contact fingers with width below 30 μm and conductivity below 5∙10-7 ohm∙m were realized, enabling low series resistance and low shading for the DISC solar cell. Meco’s plating tool-manufacturing site was visited and the relevant data for LCA and cost calculation was obtained. The first common cell integration of CSJ, TCO, and metallization developed in WP1, 2, and 3 led to achievement of a 21.2% solar cell featuring poly-Si CSJ on front and back side. the complete and advanced characterization of all tested TCOs that helped to better understand conduction mechanisms. The next generation smart wire interconnection technology lead to 2.63% relative increase in module efficiency and 2% lower performance loss after double IEC 612015 damp heat thermal cycling. LCA data collection started by site visits and a questionnaire. Development of the simulation model for raytracing analysis of smart-wire modules. Evaluation of the optimal approach for the half cutting process. Demonstration of recombination current densities around 5 fA/cm2 for electron- and hole-selective contacts on textured and planar surfaces, respectively. Application on the full area p-type c-Si solar cells results in efficiency above 22%. Further development of both high-performance In-based TCOs and low-cost Zn-based. Studies on several TCO/CSJ contacts showing low contact resistance (< 0.1 Ω cm2). Development of Cu plating approach with excellent contacting properties (rc < 0.16 mΩ∙cm2; fingers: σ > 3.7∙107 S/m, w < 30 µm, h > 15 µm) maintain VOC > 730 mV leading to 83% FF on front and rear plated 6” CZ-Si precursors with TCO. Verification of transparency dependence on deposition temperatures of poly-Si. Development of 3D simulation model for TLM measurement with complex structure geometry. Structural investigation of the impact of annealing step on TCO stacks. Initial results were already presented at the SiliconPV 2017 conference with three scientific contributions. 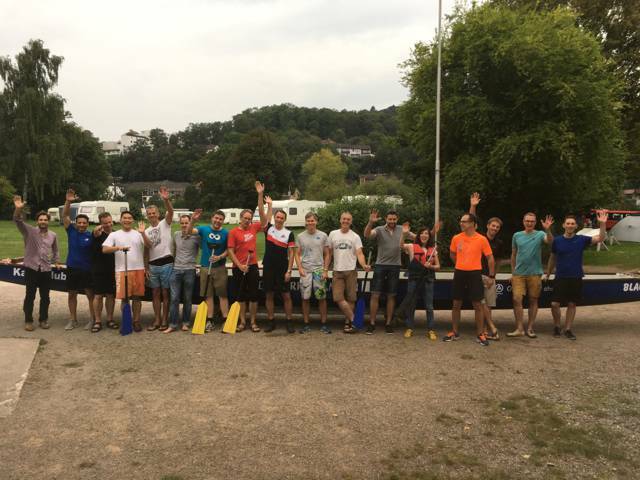 During the fruitful and constructive M12 meeting, the consortium members also proved team spirit in other disciplines. We successfully rowed the Weser river! 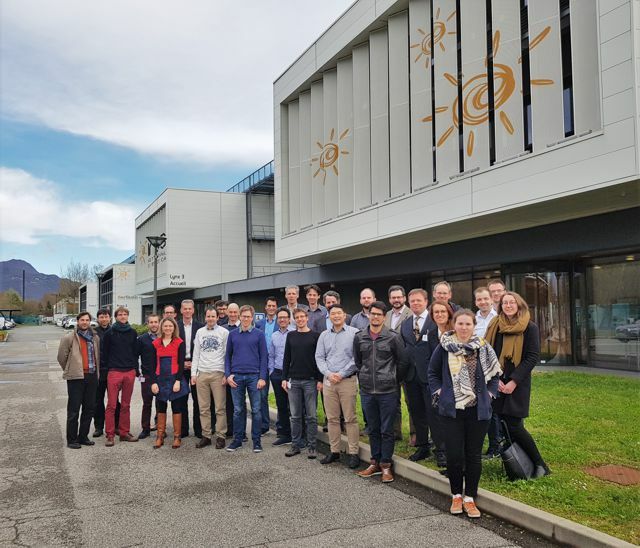 An official project meeting after 6 months of the project was held in Lyon, France. The event was attended by over 25 representatives of all 13 consortium partners. Recent project developments were discussed. Work package leaders presented the work done within the work packages. All work packages were reported to be on track with already encouraging preliminary results. Development of electron-and hole-selective junctions for textured surfaces, attaining recombination current densities below 5 fA/cm2 and 30 fA/cm2, respectively. Low-damage deposition (ALD) of In-based TCO layers with high mobility (70 cm2/V/s) and ALD of low-cost Zn-based TCO layers. Quantification of free carrier absorption losses by experiment and simulation. Design of project identity set and launch of public DISC website. A DISC project kick-off meeting has been held on Oct 4 2016 in Brussels. The entire project consortium led by the coordinator, Institut für Solarenergieforschung Hameln (ISFH), supported by a project management specialist, Ayming, and The European Commission represented by the Innovation and Networks Executive Agency (INEA) have officially launched the DISC project as of Oct 1 2016. Read the public announcement here.